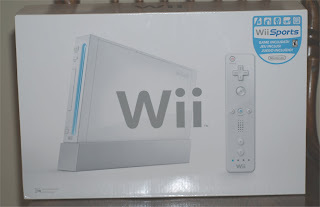 Dh came home last night with a Wii that he won. Yeah, me who gets motion sickness at the drop of a hat and hardly plays any video game, wanted a Wii. This little thing is sweet! We have been playing the sport games and I am the reigning boxing champ of the house. The tennis is also quite fun. I had a feeling it would be fun but honestly, not this much fun!